This allows a teacher to quickly see which students are struggling, which questions are causing problems, and which distractors (options) are never being selected. 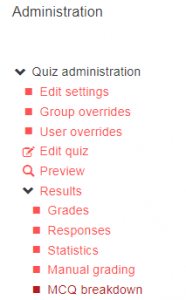 To access the tool, click the quiz and select MCQ breakdown from Results (making sure to click the arrow icon and not the ‘Results’ text) in Quiz administration. You can then filter the results according to group and type of student. In the example below a group EC100.A:1 and Registered students have been selected. You can either view results in the screen format or select Print view on the right for a more compact printable version. 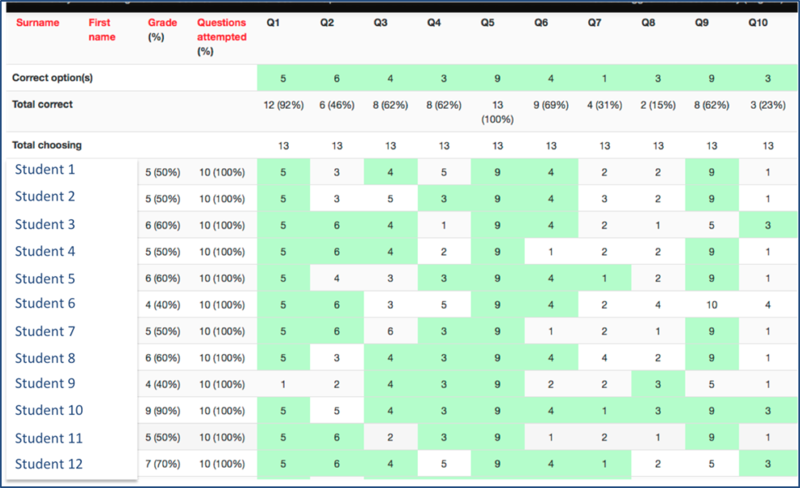 Sample summary: provides an overview of results helping you to see at a glance how many have taken the quiz and how they have performed. The main body of the report uses colour coding to help you see correct options etc. at a glance. Options chosen: shows how each student has done on individual questions and overall. You can see which questions were challenging e.g. only 41% students got Question 4 right whereas 94% got Question 7 right. The Option counts: section shows a usage count for each answer option, enabling you to spot questions where certain options are never or rarely chosen. For example, Question 10, which many got wrong, shows a strong preference for incorrect option 1 with little use of other options. Questions 7 and 8 show a similar pattern with option 2. Since a principle of good MCQ design is that all options should be plausible, you may decide to rework such questions. The final section of the report contains a list those who have yet to complete.